Stream discharge and fine suspended sediment load were determined for the upper Kuparuk River, a clear-water tundra stream and tributary of the main Kuparuk River of the North Slope of Alaska. From 75 observations over 3 years we found a range of flows of 0.3 to 28.3 m3 sec−1 and a range of sediment loads of 0.4 to 35 mg liter−1. Specific water yields of 15.7, 29.7 and 33.2 cm and summer specific sediment yields of 0.5, 1.1 and 3.5 metric tons km−2 were estimated for the period 20 May through freeze-up in 1978, 1979 and 1980, respectively. 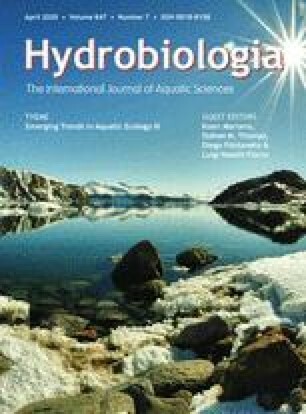 The fine suspended sediment concentrations and yields for the upper Kuparuk River were less than those in many temperate streams but similar to those reported for small rivers draining the taiga of the Mackenzie Valley lowlands in subarctic Canada.